When you decide to go to college, the tuition at various colleges will most likely shock you. Yes, everyone knows that college is expensive, but once you add everything that goes into college up, it can be a shocker. 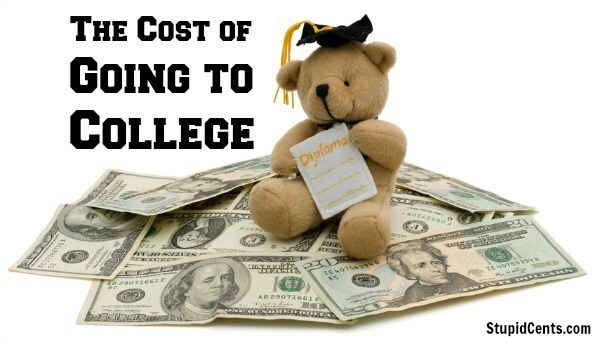 You have to think about the entire cost of going to college, so that you can be more prepared. Today’s post isn’t to scare you from going to college or university, it’s to inform and prepare you for when you decide to attend. Of course tuition will most likely be the biggest expense! Whether you are going to a state university or private college, tuition will most likely be at the top of your college expenses list. I attended a private university, then one summer I knocked out 12 credits at a community college (for the cheap price! ), and I went to a state school for my Finance MBA. The private university was around $25,000 a year (before any housing expenses), the community college was only around $1,000 for the 12 credit hours, and the state school cost around $15,000 for tuition for the whole MBA program. That’s a pretty big range! I never lived in a dorm or on campus, but I did rent a house my first year, and bought a house when I was 20. The house that I rented was very cheap because we rented it from a family member and was only $350 per month. We had to pay for all utilities and everything though, and the electric and gas bills were through the roof for how small the house was! They’re triple what the utility bills are for the house we own now. If you decide to stay on campus, then your housing costs can vary. There are almost always the cheap dorms, and then the expensive apartments and homes to rent as well. I remember one of my friends paid $1,200 a month to live on campus and she split the college apartment with 3 or 4 other girls. If this apartment wasn’t on campus, it would have been no where NEAR that cost. Of course, the cheapest way to go is to stay at home. If your parents don’t make you pay rent, then that’s even better. Oh books, these can be so expensive when you are in college! Some of my finance books cost $300 and up. And it always seemed like the most expensive books were books that I could never find used or to rent. I always went to the book store to find exactly what I was supposed to buy, write it down and compare prices online. The university book store always seemed to have overpriced books that were at least $50 over anything that I would ever find online. Renting books is also another option. I did this a lot in college. If you know that your book will be replaced next year or there will be a new edition created which would make your book worth a lot less than what you bought it for, then renting your text book might be a good idea. I was usually able to rent my textbooks for around $50 per book for a whole semester. Not bad! And a box and postage were always included for when it was time to return the text book as well. No hassle and super easy! This can include many things, ranging from bills you might have to pay (cell phone, utilities, insurance, etc.) and fees at school (such as parking, lab fees, etc.). If you decide to live on campus, there might be the possibility that you don’t need a car, but if you live off campus, then there is most likely a big chance that you need a car. There are of course many other expenses that come with a car too: car payment (if applicable), car insurance, gas, maintenance, and so on. Another big one is food. Either the really expensive school meal plans (and I don’t know about you, but at all 3 schools I went to, the food was not so great) or grocery shopping. Although I guess there’s a chance that if you continue to live at home, you can mooch food from your parents too. And there should definitely be at least a small budget line for entertainment. I know it’s rough to scrape together $10 for that on campus concert ticket or $5 to see the school’s theatrical production or $7 for the local movie theater (although we had $1 movie theater at one of the school I went to, which was awesome) – some of those are my best memories of college. Very insightful. I was going to comment on the food as well. Where I’m from it is pretty expensive! “Human fuel” alone will run those numbers up. Another thing is the interest you’ll have to pay afterwards if you have student loans. I think we can all agree it’s expensive but in the grand scheme of things the investment could pay off well! I would also like to add the cost of gas/transportation for the students who live off of campus. My sister drove to school (an hour each way) to attend the university with her degree. It was very difficult for her to afford gas. It was still cheaper than actually living on campus, but it was not cheap. Oh, books prices. I would even ask the professors one-on-one if we absolutely had to buy the most current edition. They always told me yes. I found out it was rarely the case. They just didn’t know what to say, I suppose. One time a professor told us we had to buy a $40 book. Later I found found out we only needed it for the epilogue which I found free online since the book was so old. Some professors, right? But honestly I bought my books used and resold them as slightly more used. I really never lost much so books weren’t too big of a deal to me.